While it's small in the photo, "Manufactured by Amazon.com kydc, Lexington, KY" appears above the bar code. I'd asked ahead of time if their copy was a DVD-R and was told they don't sell DVD-R's, but this very obviously is. I was set to return it when some warning bells went off. The front cover is the same as what appears on Amazon's site, with the original plastic "snap case" snap incorporated into the artwork. I couldn't see Image signing-off on this when they have the original, printer-ready artwork. The back cover? Well, it stands out in its simplicity, but does have a homemade feel and I couldn't find a reference to verify its authenticity. The TWO security labels? In an era when it's hard to find one security label on new, retail DVD's, I find it hard to believe Amazon would use two labels (and a sensormatic device inside) on a package not generally intended for retail sales. This packaging looks official, but context clues suggest it's still a DVD-R: there's no security sticker and the case has undergone the harshest shrinkwrap treatment I've ever seen. The heat was apparently so intense, the artwork sleeve isn't just warped, it's buckling. The artwork print quality also seems somewhat lacking. A few notes: the copyright date is still 2000, per Image's original release. The bar code is the same. There doesn't seem to be anything distinguishing it from the original Image DVD, unless it's the "spine" number, ID8707CODVDLIT, but again there's nothing to cross-reference with. This will also be returned. Since Amazon never answered my question, the issue of "counterfeit" is still open for debate, but my arguments feel fairly strong. Buyer beware. 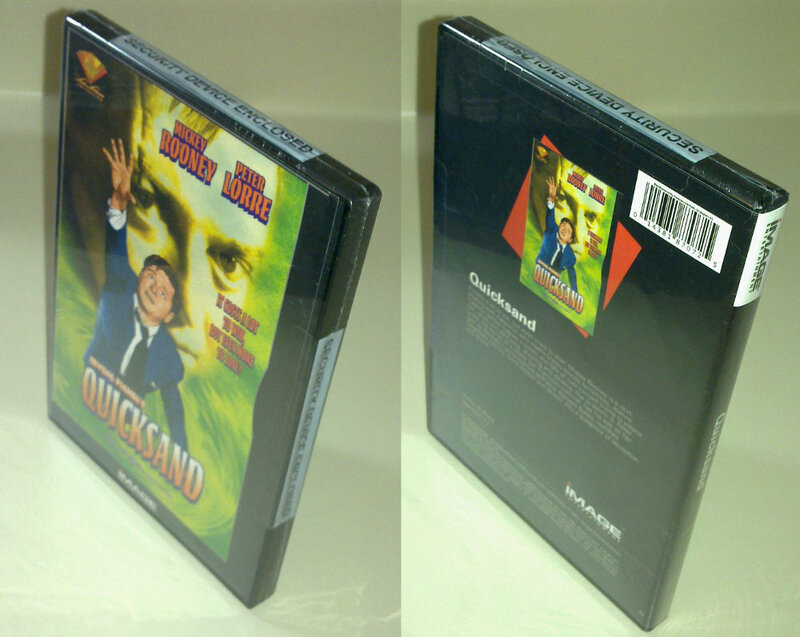 If anybody out there owns an original copy of Quicksand or a few CreateSpace DVD's, do speak up. Amazon says "DVD-R Note: This product is manufactured on demand when ordered from Amazon.com." on that product page, so it's probably that. More and more obscure catalog product on DVD is being shifted to MOD. No one involved, Amazon or the studios, wants to handle the 500 copies that this DVD might sell over a few years. So instead they burn a copy from a computer file when someone orders it. Err, you misunderstand. The only way I can account for the completely different packaging between the two items is that #1 (from an Amazon Marketplace merchant) is fake. In 2014, would Amazon really be putting anti-theft sensormatic devices in their DVD's? And would Image be paying for the privilege, when these titles aren't generally meant for retail sales? I doubt it. Seems to me somebody was overcompensating at trying to make it look official. Image originally released this film in 2000, in a snap case, then a few years later (with most of their other early catalog) re-released it in a keep case. It went MOD in 2012. The Wal-Mart item is how I expected it to look, but the lack of a credible security sticker (Image's last DVD copies were likely circa ~2006) and the harsh/uncharacteristic shrink wrap process tells me it's something else, i.e. an MOD. I returned it this morning. Yes, that first copy is a counterfeit version. A good bootlegger can create a reasonable facsimile on their own and most customers won't know the difference. I see bootleggers all the time on eBay with impeccable feedback scores. So is the one from Walmart a DVD-r as well? I've got an original from way back. It's in snapcase though. I'm sure they switched to keepcase for legit ones at some point. The only thing worse than that is counterfeiting PUBLIC DOMAIN DVD-Rs, which is what's happened in this case. Since the film is PD, the only copyright violation going on here is that Image's artwork has been hijacked. I doubt that Image (or any other entity selling this film) has enough of a financial stake in it to pursue people selling DVD-R copies of it. 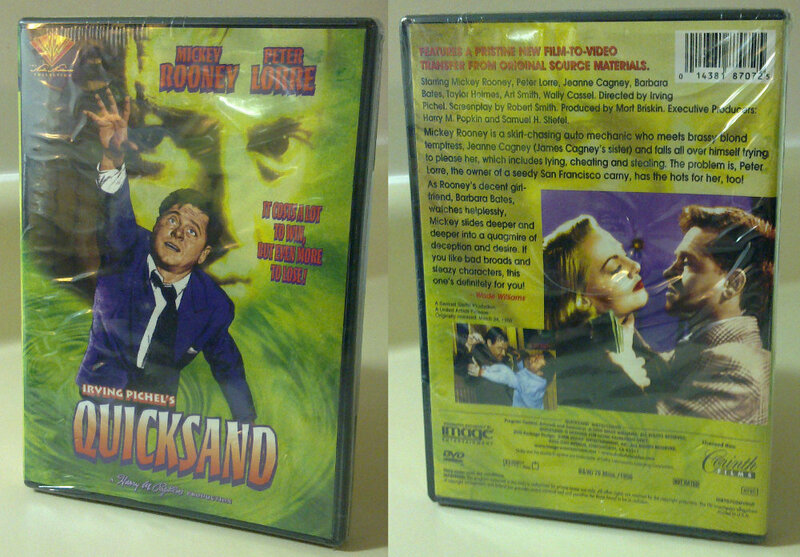 Unless you're dead-set on having the Image version, you might want to try the Roan version of QUICKSAND. That's the version I have, and it looks pretty good to me. Of course, you'll probably STILL wind up with a DVD-R copy. I don't think it's counterfeit since it has the deal on it about being created by Amazon and Amazon is indeed printing them up on demand. I couldn't open it, for fear of complicating the return, but believe it was. I was hoping for a single, standard security sticker across the top (nada...and this is also how to spot Roan and Alpha MOD's). The extreme heat applied to the case suggests it was the product of an unusual manufacturing process (else it got jammed in the heat machine and QA was asleep). Also, the artwork printing quality seemed on the low res side. IMHO 1+1+1=MOD. Does ID8707CODVDLIT or some variation appear on its spine or in the fine print on the back? Hmm, I hadn't considered its PD status. I believe any movie that's undergone extensive restoration work qualifies for a unique copyright, but in this case it was likely a straight grab from an excellent 35mm print. Yeah, I will probably just settle for the Roan. I don't think that one ever went MOD, but if so, I know how to spot them...typically by buying used. Or maybe Kino will surprise me and put out a Blu Ray? DVD #1 certainly looks official, down to its two security stickers, but just because the text says "Manufactured by Amazon", doesn't mean it was. Given that Image isn't a minor company, I still have a hard time believing their Quicksand MOD's would have two radically different looks. Yes. That number appears on the spine of my early pressed version in a snapcase. Front and back artwork is identical to second pictures posted. The pictures of front cover being copy of snapcase cover, and rear just a small picture of snapcase front look like a boot. The sticker on top of the first DVD should have the title of the movie, not "Security Device Enclosed." That's a dead giveaway that it's not a legit factory sealed DVD but somebody's less-than-expert attempt to pass it off as one. The DVD from Walmart looks like it might be the real deal, but is clearly a re-shrinkwrapped DVD. It's possible that the original plastic wrap on the DVD got damaged or the disc got loose in the case and it was sent back to the distributor who removed the original wrap and possibly had to open the case and remove the security seals in order to put the DVD back on its spindle before going overboard with the heat to re-shrinkwrap it and then sending it back out for sale. So, while the Walmart one might very well have been a genuine DVD, it's also possible that the disc might have had some scratches or light damage to it from previously being a floater. So you don't know for sure that either of them are actually a burned disc?